There are many anti-oxidants that help protect you from the ravages' of free radicals. You can and should IMO supplement many of these antioxidants. Many of these anti-oxidants can recycle each other. It will pay you big dividends if you understand the big picture of how all these antioxidant recycling interactions operate. All anti-oxidants and anti-oxidant recycling operates on a base of anti-oxidant priming, the Nrf2 Pathways. We will look at Nrf2 first. In addition to some common major antioxidants three additional important anti-oxidants are considered; Selenimum, Glutathione and CoQ10. Increasing our levels of ALL antioxidants is an important part of our healthy life. We can do this by direct consumption of foods and supplements and indirect methods. Recycling our antioxidants is a very important health enhancing method we all need to be aware of IMO. Selenimum is an important antioxidant and nutrient MOST of us lack in sufficient amounts and IMO most of us need to supplement. Glutathione is constructed at the cellular level within your body and it is not possible to directly supplement; we have to indirectly increase our glutathione through diet and supplementation with other than glutathione. CoQ10 can and should be directly supplemented by most of us after the age of 40 or so. Nrf2 is a protein contained in every cell in your body. When Nrf2 is signaled to activate it sets in motion several cellular defense systems to include antioxidation, anti-disease and anti-stress. As a general health principal you must be aware of this Nrf2 system and supply it what it needs to operate at peak functionality. Selenium is a KEY player in antioxidation. MOST of us lack even a sufficient level of selenium and must IMO supplement with care. Above and Below we show how these antioxidants, ALA and many others, help recharge and recycle each other. This should prompt you to assure you have more than sufficient amounts of each. Here we see some of the interactions between ALA and other KEY antioxidant players. Here we see ALA recycling Glutathione, CoQ10, Vitamin C and Vitamin E. This is a BIG important anti-oxidant recycling operation. Please make sure you supplement ALA. Since Glutathione recycles many antioxidants and ALA helps to increase glutathione getting more ALA in your system is a no brainer. Since CoQ10 recycles many antioxidants and ALA helps to increase CoQ10 getting more ALA in your system is a no brainer. "The chemical reactions by which oxidation occurs or is reversed are collectively called "redox" reactions. Anti-oxidants have been found to work together in networks in chains of these reactions. 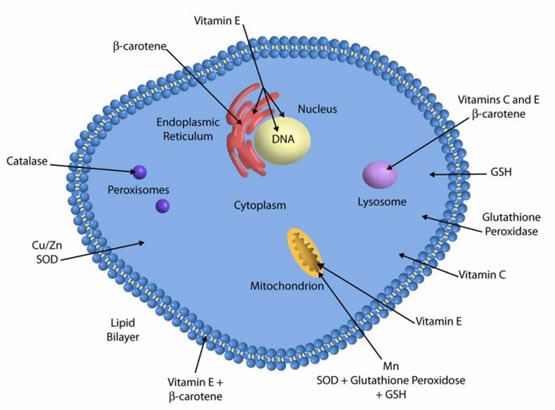 Research examining the reaction chains repeatedly document interactions between Vitamin C (as ascorbic acid) and Vitamin E (usually as alpha tocopherol) wherein Vitamin C donates an electron to a charged version of Vitamin E, thereby bringing Vitamin E back to a stable, "recycled" state. Vitamin C then undergoes a "recycling" process of its own to revert to a stable state." Does Vitamin C help "recycle" Vitamin E? If so, what is the process? Here we see how ALA, Vitamin C, Vitamin E, Selenium et al can recycle each other and other antioxidants, The simple point is IF you assure good amounts of each you may be providing the maximum anti-oxidant protection for your body. After these anti-oxidants, ALA, and Vitamin C have done their anti-oxidant jobs they becomes reduced. YOU can recycle these back into the anti-oxidant form by having sufficient BOTH ALA and Vitamin C to do this job. This increases the anti-oxidant work these anti-oxidants in your body can do. After these anti-oxidants, vitamin C, Vitamin E and ALA, have done their anti-oxidant jobs they becomes reduced. YOU can recycle these back into the anti-oxidant form by having sufficient BOTH VitaminC, Vitamin E and ALA to do this job. This increases the anti-oxidant work these anti-oxidants in your body can do. After these anti-oxidants, Vitamin E and ALA, have done their anti-oxidant jobs they becomes reduced. YOU can recycle these back into the anti-oxidant form by having sufficient BOTH Vitamin E and ALA to do this job. This increases the anti-oxidant work these anti-oxidants in your body can do.